The Gibsons & District (BC) Volunteer Fire Department was in the market for a new quint to replace a 1992 Mack 55-footer with a 1,500-gpm pump and a 300-gallon water tank. The department was looking to increase the ladder length on its new rig, keep it on a single rear axle, and wanted a number of other features like an aluminum ladder and a strong safety rating. Gibsons & District found what it wanted in an E-ONE HP 78 aerial quint. Gibsons & District’s other apparatus are a pumper with a 1,500-gpm pump and 800-gallon water tank, a pumper-tanker with a 1,750-gpm pump and 1,200-gallon water tank, a Ford F-550 initial response CAFS pumper with a Odin 120-gpm pump at 120-cfm, and a rescue truck. Joe Hedges, product manager for chassis and aerials at E-ONE, says the single-rear-axle HP 78 “is a very proven design, a workhorse of a truck, well equipped, with a 750-pound tip load, and a prepiped waterway rated at 1,000 gpm.” Hedges notes that the HP 78 quint for Gibsons & District has a Hale Qmax 1,750-gpm single-stage pump, a 500-gallon water tank, a 30-gallon integral Class A foam cell, a Hale 2.1A FoamLogix foam system, and a Class 1 TPG pressure governor. 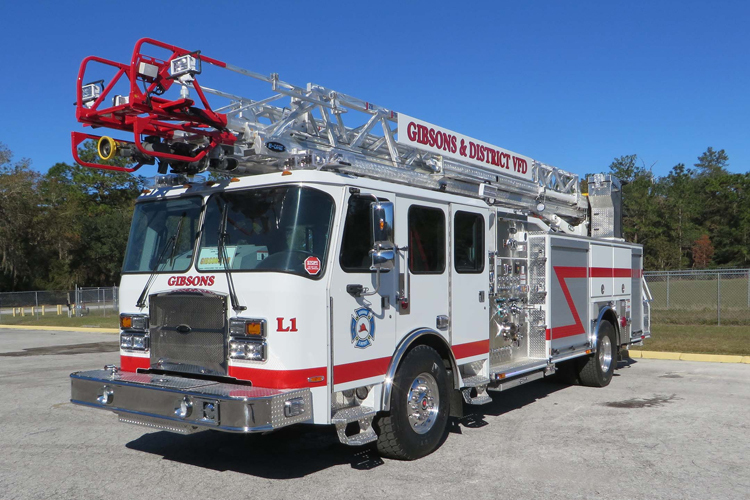 Ian Manley, director of apparatus services for Associated Fire Services, who sold the quint to Gibsons & District, says that the department told him they were impressed by the E-ONE aerial’s 2.5:1 safety factor as well as its aluminum construction. “An aluminum ladder is very low-maintenance because it won’t rust like a steel ladder will,” Manley points out, “and it doesn’t need rung covers like steel does.” Manley notes that the aerial quint carries a 1,000-gpm Elkhart Brass Cobra wireless remote monitor at the tip as well as a Task Force Tips valve under monitor (VUM) with a 2½-inch discharge that will allow the department to hook a 2½-inch hose for operations on a roof or through a building’s window. McClymont notes that the department also wanted an unusual arrangement in the vehicle’s hosebed. “We wanted to carry 800 feet of four-inch LDH and 800 feet of 2½-inch hose, which E-ONE was able to do for us in a SideStacker hose bed,” he says. The quint is powered by a 450-hp Cummins ISL9 diesel engine and an Allison 3000 EVS automatic transmission, with a 19,840-pound Meritor front axle and 33,000-pound Meritor rear axle. The vehicle’s wheelbase is 220 inches, overall length is 37 feet 2 inches, and overall height is 11 feet 8 inches; the rig is built on a Typhoon medium cab with seating for six firefighters. Hedges points out that the quint has two 1¾-inch crosslays, a 2½-inch crosslay, and a front bumper discharge. “It has 89 feet of ground ladders, a Federal Signal Navigator NVG25 model light bar, Federal Signal Quadra-Flare LED lower level warning lights, two FRC Spectra 12-volt LED scene lights on telescopic poles behind the cab, two Federal Signal VSLR1 LED rotating beacons at the rear, a Federal Viper EXT LED directional bar at the rear, and a Whelen electronic siren. Previous: Prove How I Didn’t Meet Your Specs!